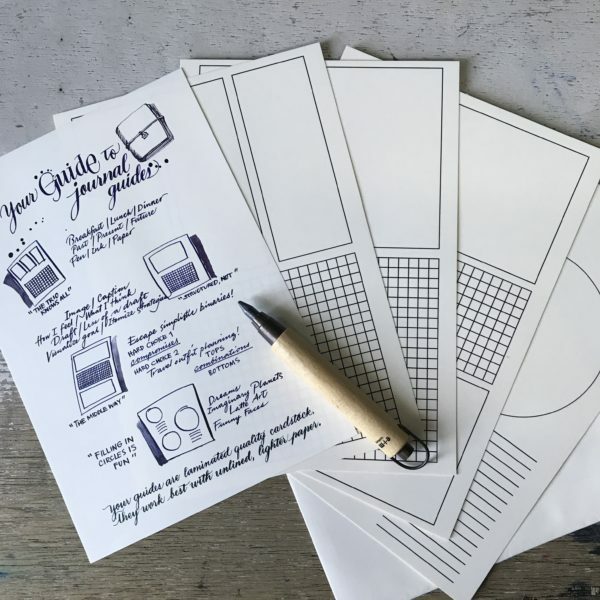 How to make your own watercolor and other diversions. – Leigh Reyes. My Life As a Verb. 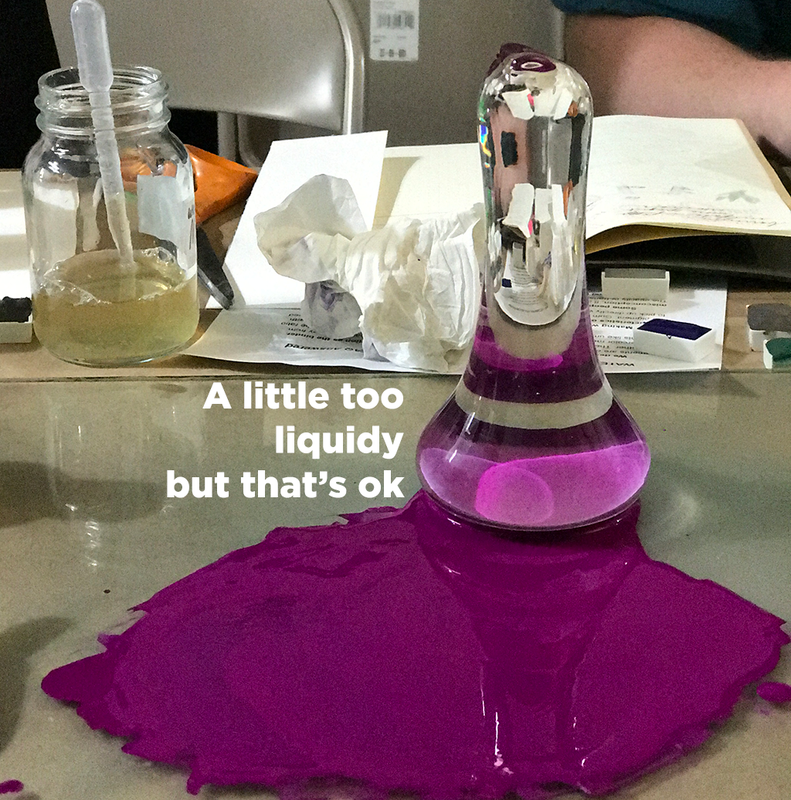 There are many reasons not to make your own watercolor. Not enough time. Lack of access to tools and materials. Besides, you can buy ready-made, ready-to-use watercolor and start painting immediately. And then there’s WHEEEEEEEE! I CAN MAKE MY OWN WATERCOLOR!!! Other people go to Katz’s, I proceed to Kremer. 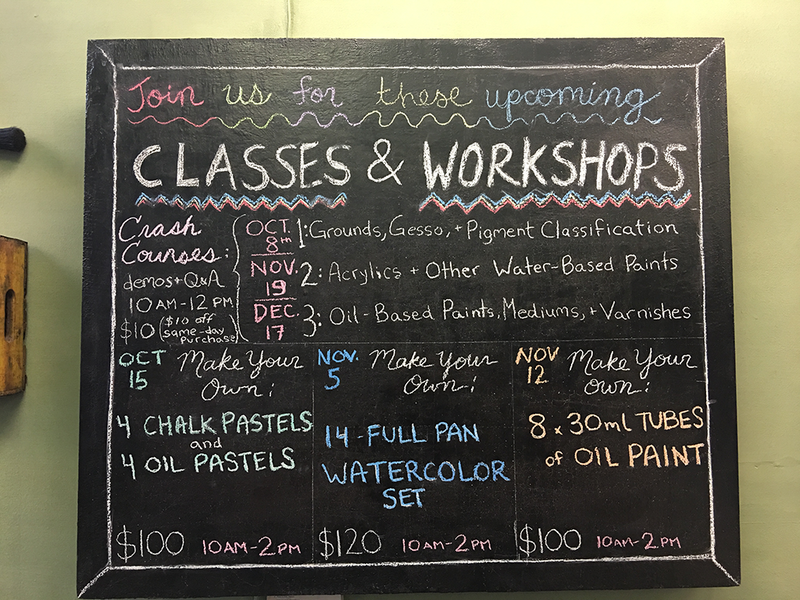 I’ve always wanted to take a class here but somehow their class schedule and my work trips never coincided – until last April. 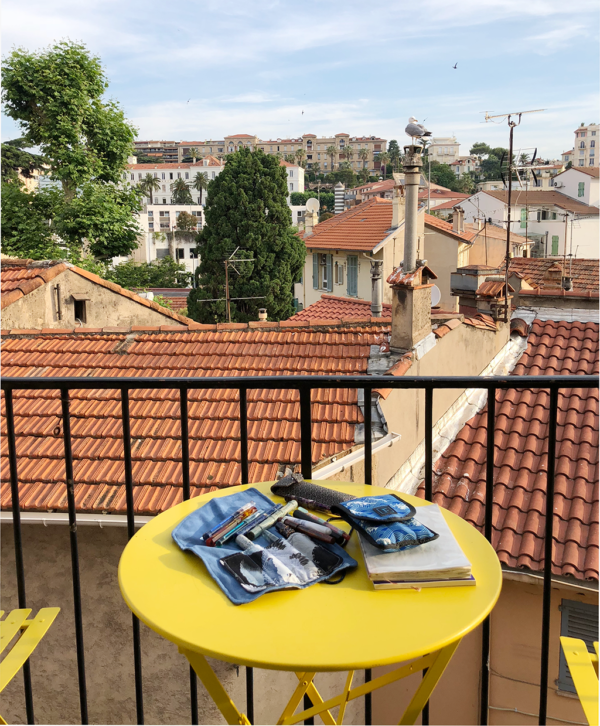 A good friend reserved slots for us and we took the stairs to the basement, where worktables and pigments were waiting. 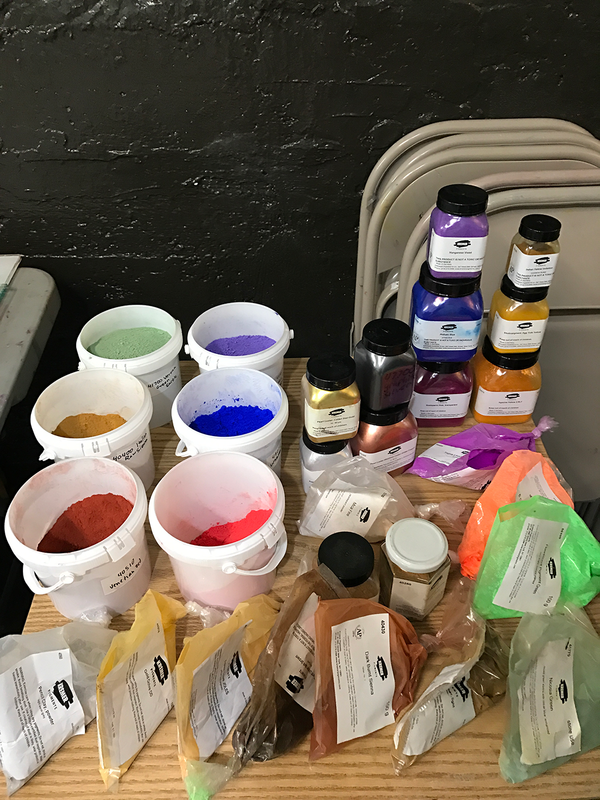 Our instructor, Rachel, explained the pigments we would use presented different qualities. Earths were the easiest to mull. Fluorescents would need a spritz of alcohol to blend more easily with the watercolor medium. Others required more elbow grease. 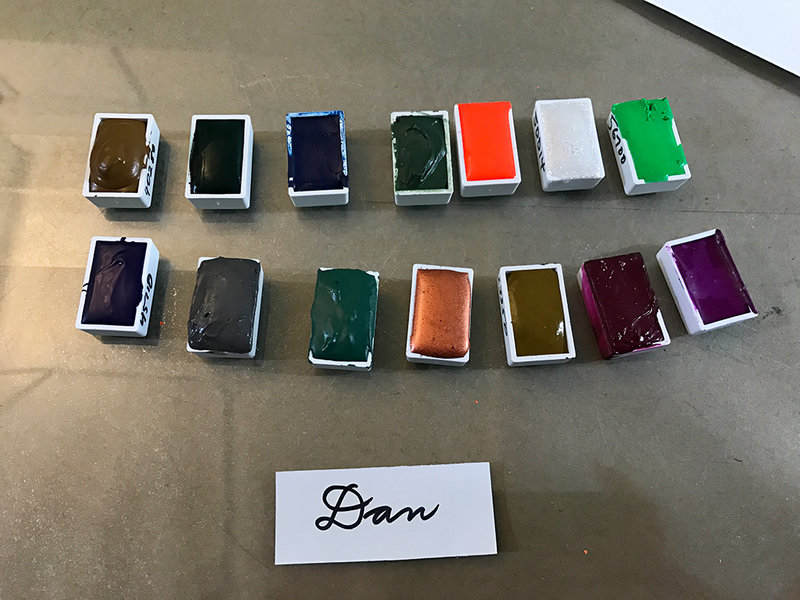 Our instructor eyeballed the pigment quantity, and told us more or less how many pans a certain amount of pigment would make. (This depends very much on which pigment it is.) We began with a yellow ochre. She reminded us to make sure to write the pigment numbers on the pans. After making the initial mixture using the spatula, we employed a glass muller. Mullers have flat bottoms and disperse pigment more evenly and thoroughly throughout the medium. 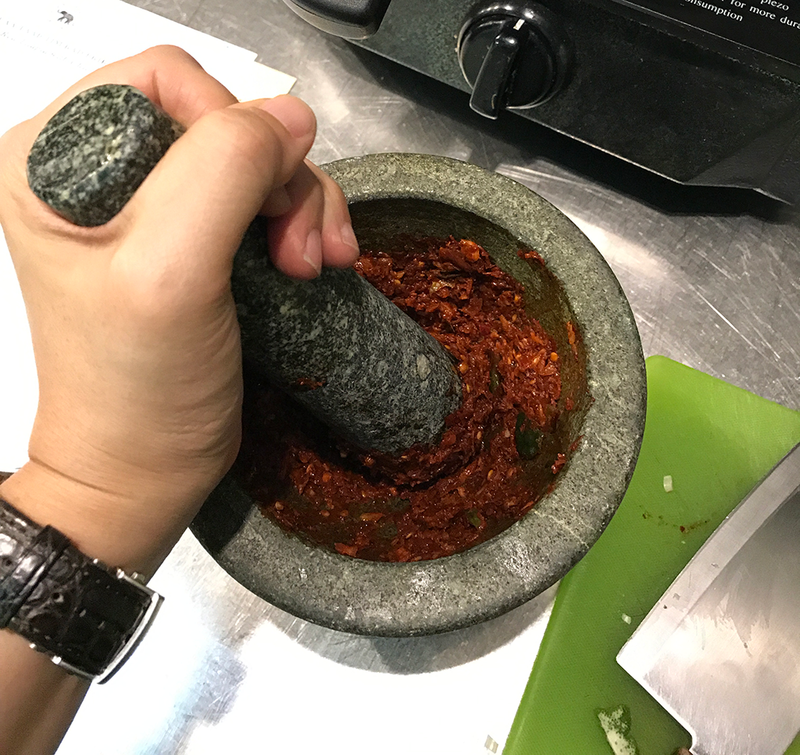 I’ve used a mortar/pestle setup and, while close, it’s not the same. (I do think the mortar/pestle works for reviving dried watercolor.) 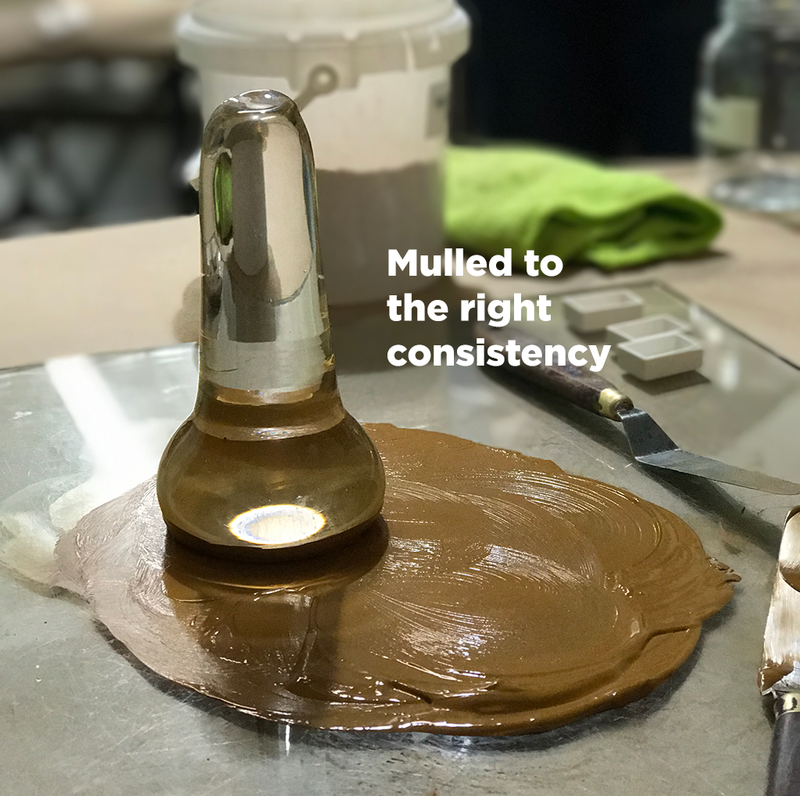 Using one or both hands, you grip the handle of the muller and, applying a little pressure, work the pigment into the medium. 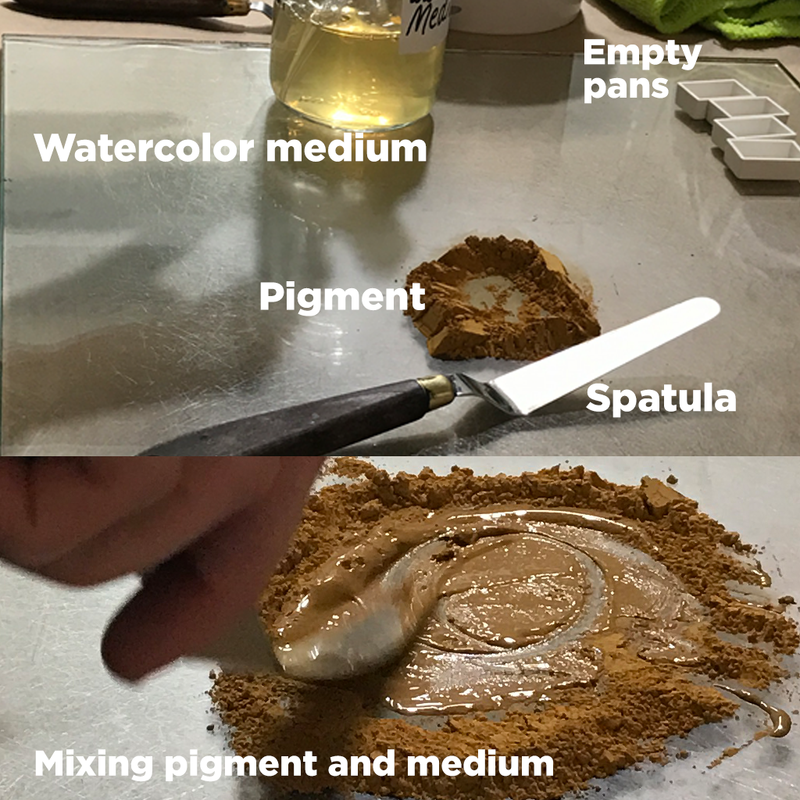 After mulling the mixture, we used the spatulas to scrape the muller clean, and lift the watercolor from the glass work surface to put in the pans. 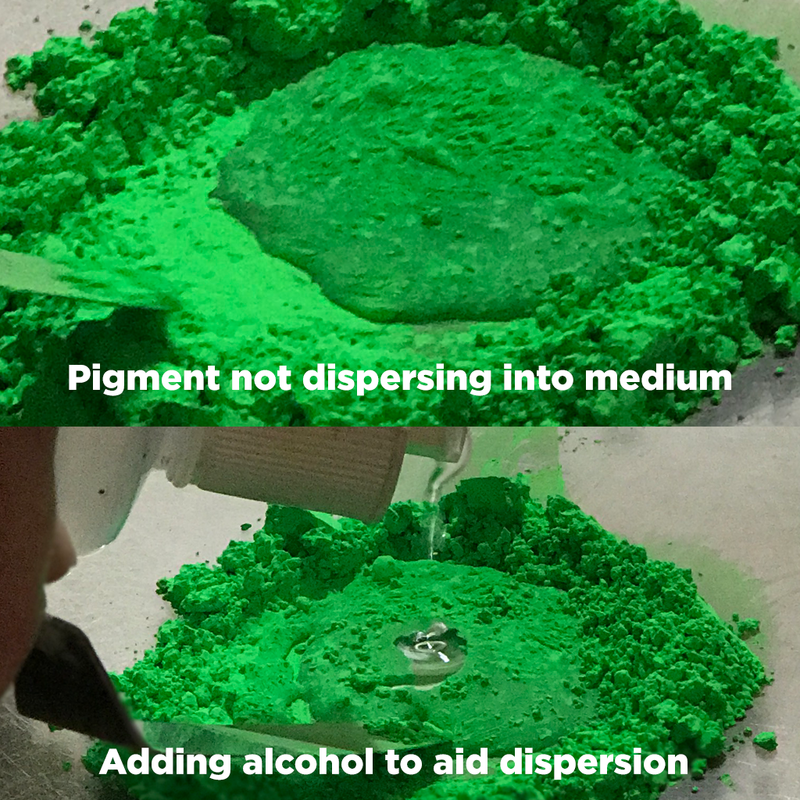 Different pigments require different techniques, and I’m sure there are advanced classes for that. 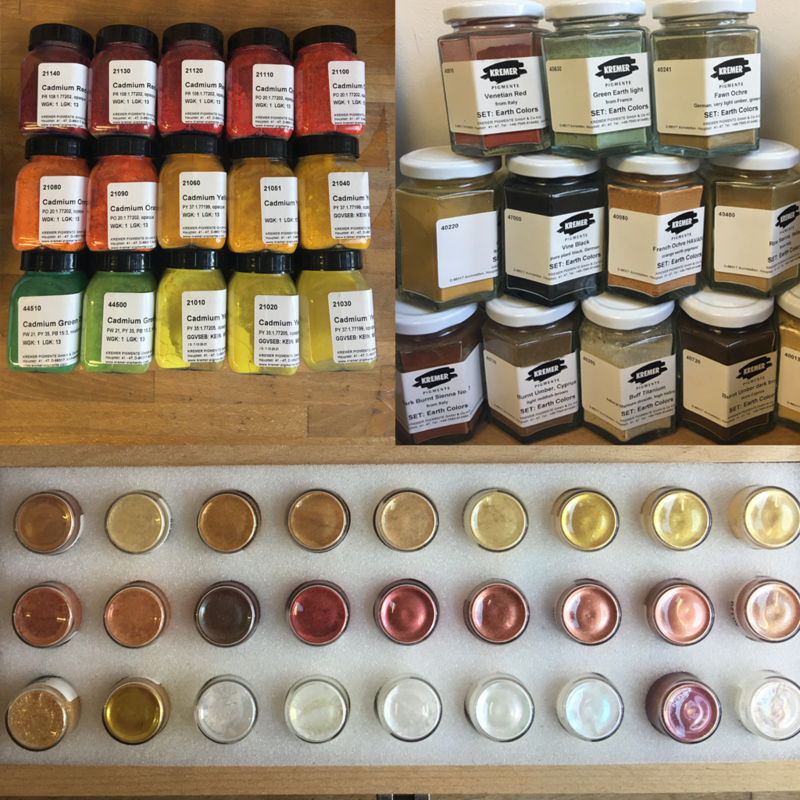 It will take time and experience with a wide range of pigments to have a feel for the process and result the way our instructor did. Dan’s pans, because I totally ran out time to take a picture of mine. Note the pigment numbers written on the side. This helps a lot! Dan mulled the fluorescent pigments. They turned out pretty smooth and even, and settled into the pan well. Do the earth pigments first, they’re easier to disperse into the medium and offer relatively quicker gratification. 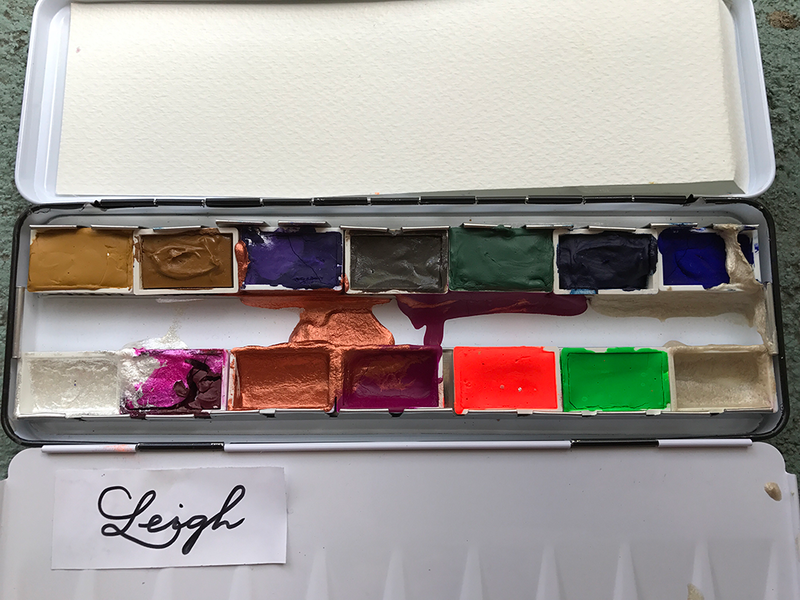 Yes, you’ll need that confidence when you tackle the more intransigent pigments. Work in large batches to share with classmates. Doing three or four pans’ worth in one go doesn’t need much more time than doing just enough for one pan. Don’t fly out the next day if you don’t have to. (I had to.) Freshly-made watercolor takes time to set, at least a week to dry thoroughly. I kept the box at the bottom of my bag so it would stay as level and immobile as possible, but a security check on the way nudged the box just enough to encourage the still-wet watercolor to move around. Made for a pretty unique set, though! We needed to fill 14 pans in 4 hours and it wasn’t nearly enough time, especially as I’m a klutz. 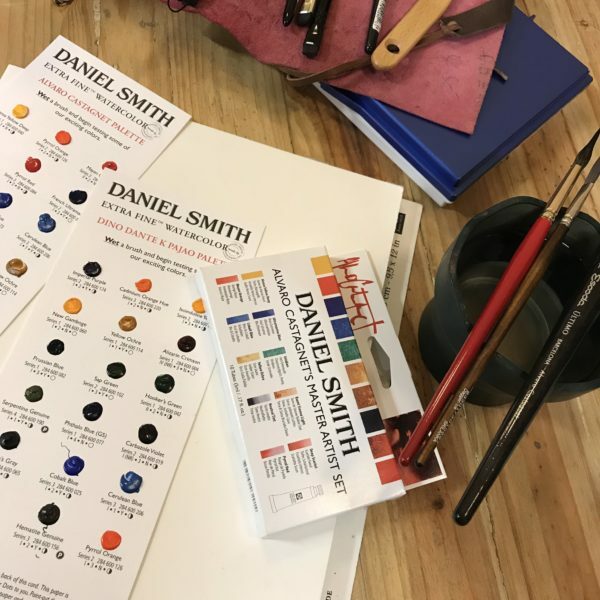 The watercolor-making class is totally worth it, and I’m really hoping another work trip coincides with a historical pigments class.